This program was developed to take advantage of the benefits of students talking honestly and passionately to other students about drinking and driving - and answering their questions. It provides students with additional positive role models. This program will provide registered chapters with trained student speakers at no cost to registered chapters. The presentations of Young Speakers will reflect their own personal testimonies and experiences with SADD. Chapters interested in booking a speaker should contact the Provincial SADD Office. We currently do not have any young speakers. Why not think about becoming one yourself? How Do I Become A Young Speaker? To be accredited as a SADD Young Speaker, students must submit a written presentation and attend a 1-day seminar in Regina (expenses paid). Presentations should be approximately 20-30 minutes in length. 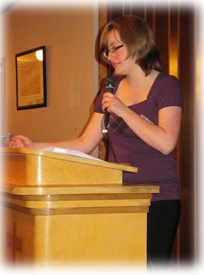 Young Speakers will receive continued support from the Provincial Office and may also be encouraged to meet with a member of "Toastmasters" in their home communities. Young Speakers are reimbursed traveling expenses and paid $25 for each presentation. Please contact the Provincial Office for more information about this program.